On a bumpy Lausitzring surface Lorenzo Savadori (IodaRacing Team Aprilia) proved fastest after two hours on track, securing the overnight advantage near the end of the second session. Recent double IDM Champion Markus Reiterberger (Althea BMW Racing Team) was second quickest in his comeback ride, while it took 2013 World Champion Tom Sykes (Kawasaki Racing Team) until late in the afternoon to move up to third. His team-mate and championship leader Jonathan Rea (Kawasaki Racing Team) lost time each lap in the final section and finished 11th, outside of automatic qualification for Superpole 2 on Saturday. He now has to qualify out of Superpole 1 on Saturday to earn a place in Superpole 2. 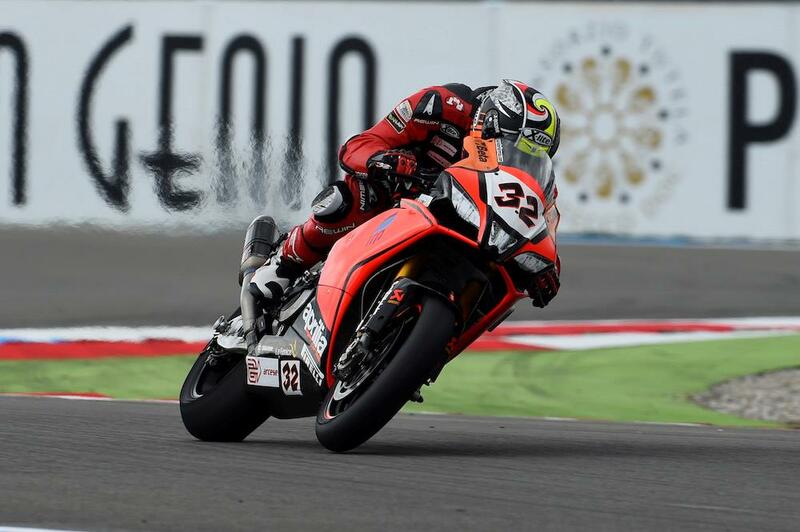 Chaz Davies (Aruba.it Racing - Ducati) placed fourth on Friday. Nicky Hayden (Honda World Superbike Team) pushed his CBR1000RR to fifth place, and was leading the field for a time. 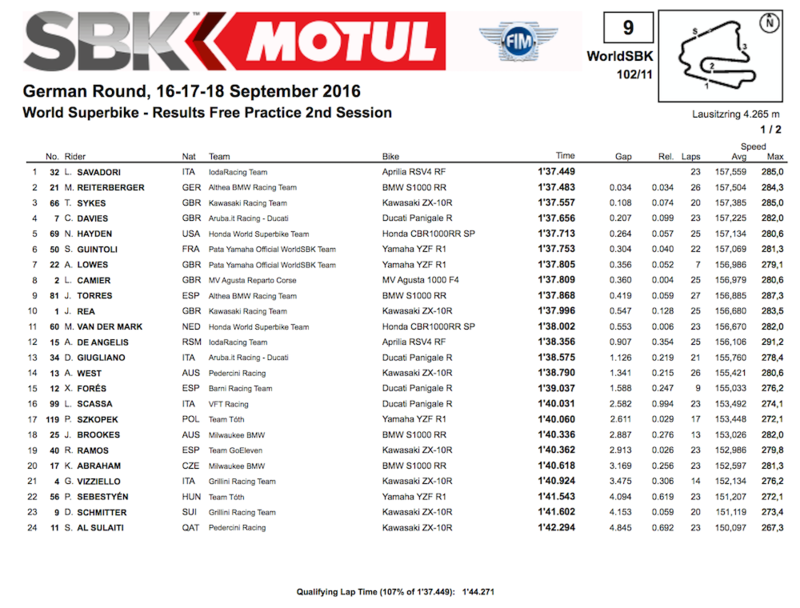 A great eventual comeback from injury for Sylvain Guintoli (Pata Yamaha Official WorldSBK Team) saw him sixth fastest in qualifying in a close session at such a twisty and intense circuit. Best qualifier in the morning session, Jordi Torres (Althea BMW Racing Team) used BMW’s local knowledge to put himself into seventh place overall. Alex Lowes (Pata Yamaha Official WorldSBK Team), Leon Camier (MV Agusta Reparto Corse) and Michael van der Mark (Honda World Superbike Team) rounded out the top ten ahead of Rea. Josh Brookes (Milwaukee BMW) suffered a fast fall after losing the front between turn 11 and 12 in the afternoon session, jumping up to walk away after his bike had tumbled over and over on the grass runoff area. His crash eventually brought out the red flags to clear the affected area. Brookes ended up 18th overall. Davide Giugliano (Aruba.it Racing - Ducati) was 13th on his factory Ducati and Anthony West (Pedercini Racing Kawasaki) was 14th.